Last night I was tucking Grandgirlie into bed and she asked for a story of when I was little. 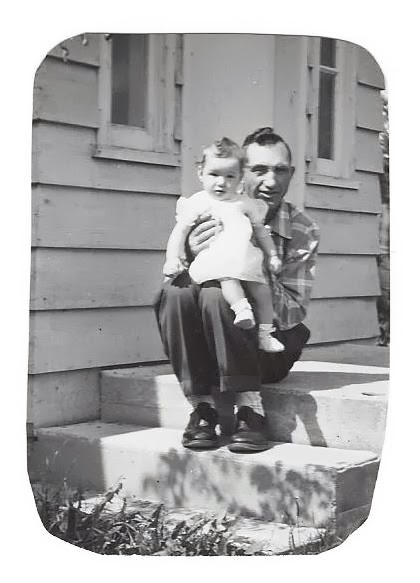 Because it is Father's Day weekend it seemed fitting that I tell her a story of my Dad when I was a little girl. I asked her if she has ever been homesick? I went to a small country church when I was young and for whatever reason my parents thought that it would be a real treat for me to go to our Church Summer Camp. I wonder if they asked any of my friends parents if they wanted to send their daughters? It was exciting to pack up my suitcase and the adventurous spirit in me took over any qualms that I might have had. Perhaps it was the distance we drove which was further than I might have expected. It was the summer I was going into Grade Four. I wonder what it cost my parents to send me to one week of summer camp. It would have been a sacrifice for them I am sure and I can well imagine they sent me to give me a special treat mid summer. Maybe the family all needed a break? No..that couldn't have been the reason. When we arrived at the camp I quickly realized that I didn't know anyone. Other girls seemed to come in pairs and their excitement of being left was plain to see. Parents were not encouraged to linger and so soon my parents hugged me goodbye and left me in the capable hands of a camp counsellor. The cabins were clean and musty and had four or five bunk beds. I had fun. I enjoyed the camp food. Each day consisted of swimming, hiking, crafting, devotions and free time. I suspect it was the free time that did me in. I began to experience home sickness for the first time in my life. I missed my family and wanted nothing more than for that week to end. My Dad worked for the Highways Department and in summer they fixed roads. What would it take for a man to say to the crew he was working with that he wanted to drive up a mountain with the asphalt truck to see his little girl? or would he have asked them if they knew there was a camp up above Cultus Lake where they were paving pot holes that summer day? I was on my way to the scheduled daily swim when I saw a familiar orange Highways Department Truck come up the gravel driveway. I stood still and held my breath. Was my Dad wondering how on earth he would locate me in the middle of the day? I watched the men all hop out of the truck and then I saw him. but I remember asking him if I could come home with him. I couldn't of course and it seemed so sad that he would leave me there again. I cried...and my very soft hearted Dad had to gulp hard. Parents came to pick up the kids on Sundays. My suitcase was packed and I was happy to go home. My Dad was 41 when I was born. He was cleaning eggs by the phone taking care of my older brothers while waiting for my Mom to call with news of the new baby. I'll be right there...he said. God blessed me with my Dad. *Sniff* I read this aloud to John and nearly didn't make it through. Such a sweet story and did your grandgirlie like it? What a sweet memory of your did Lovella - he must have had a very soft heart for his only girlie. Sweet memories of your dad and summer camp too. I was so homesick at camp and even had other girls I knew from school there. Oh how sad that you couldn't go home with him right then. Love the photo of you and your dad! That is a sweet memory. I can't imagine too many dad's convincing their co workers to take a little detour in their work day to visit one little girl at camp. Those were men with kind hearts. I'm sure it spoke volumes to them as well. Sweet photo of you and your dad. I'm sure your little grandgirl enjoyed that story last night. This post made me just a bit teary ... so sweet! what a beautiful story of a father's love. (tears....) Thank you for sharing this story and all of your stories. I enjoy them all. I love this story. How special to have your dad come pay you a visit at camp...and to bring all his co-workers in tow! I love the camp story (and can relate in the homesick department!) but THIS line of the story - "Lovella is here...she said. I'll be right there...he said" is PRECIOUS! aww - such a sweet story and memory! When our little girl was born (after 4 dear little boys), her daddy laid his head down on the delivery table and cried :) a father-daughter relationship is very precious. Loved this post! Love the emotion included in it, and it really made me miss my dad. I am so thankful you were blessed with a dad like you had, and I am sure your grandchildren will never forget your story.